A heaven of calm on the seaside, RICHE HUA HIN is a truly remarkable destination. This seaside sophisticated retreat is one of the most exciting cites in Thailand. With the contemporary, classic, and cutting-edge styles of our hotel, we are the ultimate HuaHin address. 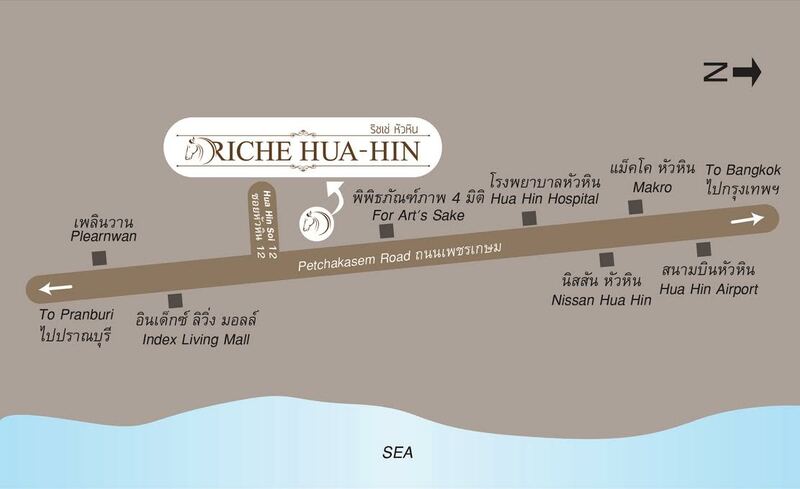 RICHE HUA HIN is located in the south-west, close to HuaHin Soi 12 and the main road, next to For Art’s Sake (a 4D art museum). A five-minute drive from RICHE HUA HIN to HuaHin town and Night Market is our pleasantly welcome feature. Not only the hotel is excellently situated in a peaceful central location of HuaHin, it is bridged within easy reach of all other nearby tourist attractions.